More and more, we’re reading about the “greening” of America, and how by going green, we can help to save our environment. We can do our bit by looking for green solutions, and create what is a green home. First of all, green home construction methods like recycling of certain materials and minimizing construction waste can save builders money when constructing a home. Building using local materials also save on labor and transportation costs, keeping pollution to a minimum. “Green construction solutions or home outfitting can save thousands of gallons of water a year and reduce power and gas bills by as much as 30%,” the author claims. And that translates to savings for the home owner. Heating and Cooling: Use insulation to reduce heating and cooling energy costs. Green insulation like wool insulation can also be used. Plant trees in strategic locations on the property to shade the home from heat and damaging sun rays. Energy-Efficient Appliances: Install appliances that use lower power consumption. Look for those with the “Energy Star” rating. This will reduce the amount of pollution from the generation of energy, since “about 90% of electricity generate in the US comes from nonrenewable sources including fossil fuels and nuclear power,” states Mother Earth News. Look at options for major appliances like washers, dryers, refrigerators and dishwashers. Water: If you don’t want to go as far as collecting rainwater for irrigation, opt for low-water usage appliances and fixtures like washing machines and toilets. Don’t let water run while brushing teeth or washing dishes. Energy: Invest in solar panels to collect energy to provide power to run the home and heat water. Many times, those who use solar panels can sell their excess electricity back to the power company. Green Products: Forego the use of chemicals for cleaning and look for green home alternatives. This will increase indoor air quality by reducing the amount of toxins in the air. Build with environmentally-friendly materials. The National Green Building Standard™ certification provides “Independent, third-party verification that a home is designed and built to high performance in six key areas: site design, resource efficiency, water efficiency, energy efficiency, indoor environmental quality, and building operation & maintenance.” It focuses on three attributes: healthy homes, lower operating costs, and sustainable lifestyle. A green home home provides fresh air ventilation, limits pollutants and contaminants and prevents moisture problems. Lower operating costs provide cost-effective energy and water practices. Sustainable lifestyle preserves the natural resources surrounding a home, reduces home maintenance through durability, and promotes a walkable lifestyle. 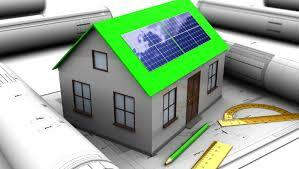 Want to Know How You Can Have a Green Home? Contact Först Consulting Group. We offered an overview of what is a green home here, and will discuss ways you can make your home greener in our next post. If you are considering building a green home and would like professional assistance on choosing products and selecting the right builder, contact Först Consulting Group. We provide independent, third-party consulting services to aid homeowners through the selection, negotiation and construction processes. Contact us today. Aging in Place: What You Need to Know →← What Does Licensed and Bonded Mean?